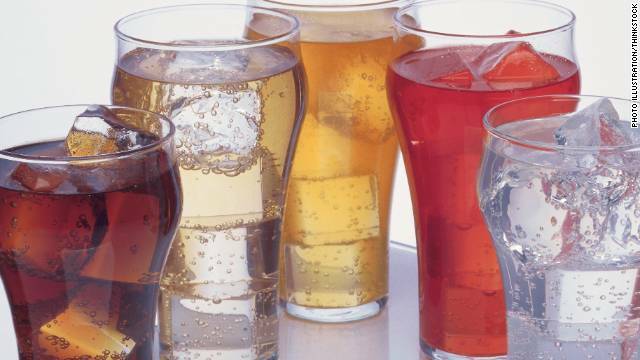 Are school soda bans effective? Banning only soda in school is not effective in reducing consumption of sugary drinks, a new study has found. In the absence of soda, students turn to other sugar-sweetened beverages such as energy, sports or juices that are available at school. When schools banned all sugar-sweetened beverages such as energy, sports drinks and sugary fruit juices, students bought fewer of these items. Yet, about 85% of students, regardless of what kind of policy their schools had, drank sugary beverages weekly, according to the study published this week in Archives of Pediatrics and Adolescent Medicine. And 26 to 33% of students reported daily consumption. “This indicates the school environment is healthier, but that kids are able to compensate in some way, whether they get it at a convenience store, home or fast food restaurants,” said lead author, Daniel Taber, postdoctoral research associate at the Institute for Health Research and Policy at the University of Illinois at Chicago. State laws that restrict sugary drinks in schools have “done what they’re designed to do - they can only go so far. They need to be complemented with other laws,” he said. The Institute of Medicine recommends drinking water, and limited servings of 100% fruit juices and skim or non-fat milk. The institute, an independent, nonprofit organization that gives advice to decision makers and the public, also recommends that all sugar sweetened beverages be banned from schools. This is because soda accounts for more calories than any other food or beverage groups for teens between the ages of 14 to 18. Overall, 24 states have laws banning soda or sugary drinks from being sold in schools. The study looked at almost 7,000 students from 40 states. They were sampled in fifth and eighth grades (2004 and 2007) about their beverage consumption habits and whether their schools permitted sodas and other sugary drinks. “Schools are huge pieces of the puzzle, but they’re not the only pieces of the puzzle,” he added. The study found that when the students’ access to sugary drinks became restricted, the infrequent soda drinkers reduced their consumption. But the frequent sugary beverage drinkers increased their consumption “suggesting that heavier consumers compensated to a greater extent with increased consumption outside of school,” wrote the authors. The American Beverage Association called the paper “effectively useless,” because the study looked at data from 2004 and 2007. This was before the industry made changes by only offering juice, low-fat milk and water in elementary and middle schools, according to a statement by the association. Taber responded by saying that while many changes have taken place to provide healthier beverages, sugary drinks are still available in high schools. “Despite the incremental progress, there is still a lot of room for improvement as we try to provide students with healthier school beverages,” he said. So once again a subject like sodas rates for the publishing of an article while bullies still assault other children at will. Sodas represent MONEY gained by corporations SELLING soda to children for corporate PROFIT. Preventing the brutal assaults of children every day is just a big COST that nobody wants to properly address, along with bullying in general. Of course. New rule: no reporting on anything short of murder in schools while bullying is still a problem. Obviously those problems, even if schools are spending money to address them, are beneath public notice. @JLS639 Children being ASSAULTED should rate high enough to actually get resolved, in which case there wouldn't be a priority of articles issue in the first place. Publishing an article about S-O-D-A P-O-P rather than focusing on PROTECTING children from assault trivializes the later and reveals diseased priorities. Don't even think about reporting on either soda or bullying until the problem of ONE MILLION DEATHS PER YEAR from malaria is resolved! How DARE you trivialize ONE MILLION DEATHS PER YEAR by talking about soda or bullying? At least kids being bullied lived! JeramieH: How dare you?! You realize that more people dies from heart disease than any other cause, and you want us to report malaria! Obviously you do not care how many people's mothers, fathers and even children die as long as CNN writes about your petty plasmodium infestation. CNN should become the Coronary News Network. Voltairine...I don't agree. Childhood obesity increases everyday. This is life threatening. Look up the statistics of heart disease in children or the increases in diabetes. You might be amazed. Although bullying is a serious problem, it is not the only problem to be solved. That is a DIRTY EVIL WORD. How dare anyone make a profit!!! Hey, i am a kid who attends a small high school, I am thin bordering just barely underweight, not unhealthy, but because of this stupid law, I can't get a soda when I think it's a good enough day to treat myself to one, Ive worked for almost every electronic I have except my family's wii, and about everything else through my year round and summer jobs. It is not fair that I am punished for the wrongs of others cut around the stupid "don't single anyone out or they might feel bad" of this era and tell people they themselves have a problem and directly apply stuff to help them and not hurt everyone else without that issue! Oh no, We're worried they will ruin their self esteems, give me a break. Wow, when something is banned in schools people buy less of it in schools. Color me stunned. When schools and government agencies offer nutritional education and advice then follow it with bans, they're effectively saying that they never really intended for the campaign to be voluntary, they did not trust the targets of their educational efforts to make their own choices, nor do they trust that their own educational effort would have the desired effect. What's the point of spending time and money teaching and advising to make different choices if, shortly after, you're going to deny any choices that don't conform to the advice? Just skip straight to the ban and save time and money. Even better, have the guts to come right out and say "We know what's best for you, individual differences in diet and exercise don't matter, and we don't want you having this choice anymore." If allowing the choice means abandoning a third of children to be obese, as it stands currently, then what do you suggest? You can't regulate good parenting. School curriculum can only go so far. Lessons at a school desk have a hard time competing with the bright red shiny sugar bomb machine. I agree that trying to regulate what people, even children consume is a hopeless fight. Banning these things from schools is silly, but ultimately doesn't bother me that much. The idea that they want to pass more laws to restrict children from eating this stuff outside of school is just crazy. I'd think the best approach to keeping kids, and people in general, from consuming so much sugar in their drinks would be to provide good, cheap, and readily available water. In the last ten years I've worked in places with bad water quality, and vending machines that sell soda cheaper than bottled water. The only time I usually take a sugar drink over water anymore is when it's already priced into my meal and I feel like I need to drink it or I'm wasting my money, which I realize is a silly psychological hangup, but it's there none the less. "Wow, when something is banned in schools people buy less of it in schools. Color me stunned." Yeah, they probably paid someone a whole bunch of money to study that and reach a conclusion. That's why government is so inept. They check their common sense at the door in the morning when they report to work. Gee, children have all sorts of restrictions put upon them BECAUSE they are children. Attending school of some sort is mandated by state laws. Schools restrict children in many numerous ways just like parents do. So if the school is trying to teach students better nutrition and then turns around and sells sugary drinks, what do you think that the students will think? I think it makes a huge difference – my HS had a ban on all sodas and junk food. We went from having candy bars and costco muffins in the student store, to having mini bags of gardettos. It was really sad. But I probably would have eaten a lot more crap if it had been readily available like it used to be. I say go forth with the bans. Banning sugary drinks will make a few kids mad (such as me) but at my school we keep sugary drinks in our lockers and take them to lunch and I don't see very many sugary drinks at my school and sugary drinks keep me awake in school, I'm not an early bird and other kids aren't either so i wouldn't ban them. Put down the sugary drink and pay attention in English class. Your lack of sentence structure is appalling. May I introduce you to the concept of the run on sentence? How about a comma? Maybe even a period? I agree there should be a ban on sodas and sugary foods. The less wound up a kid is the more he wont fight back. Then on to the next. Times are tough and there ain't as much lunch money out there to go around. Wouldn't it be a better measure of success to compare sugary drink consumption at a school without soda to a school with soda, instead of stating that "some kids do it daily even in a soda/free school = failure"? Banning soda and other sugary drinks does nothing to address the underlying cause of obesity, which is bad eating habits and a lack of any sort of concept of proper nutrition. Soda alone does not make one obese– my high school had vending machines with soda and other sugary snacks and yet we did not have an obesity issue at all, likely because we were taught proper nutrition in our health class. It's far more effective to teach kids proper nutrition and good eating habits (something that will serve them well for their entire lives) than it is to not allow them to drink soda for part of the day. The study even showed that kids drank more soda outside of school when it was banned. Me thinks the banning of sodas kid just another attempt by overzealous health nuts to save the world from fat people. Soft drinks have been around for almost a century, yet the onslaught of obesity has only occurred more recently. It's not the soft drinks...especially those sans sugar, its the crap that people eat with it. You want to blame someone or something for fat kids. Blame the schools for no PE classes. Blame the indoor video games or TV. Blame neighborhoods with no open space to play. A can of cola never made anyone obese! I think you have some valid points Tony. But whereas soda has been around for a long time, the marketing and placement of soda at schools has been on the increase. Over the past 10 years many schools (or school boards) decided to start letting soda companies provide them with new gym equipment and scoreboards in exchange for exclusive vending rights. So the availability has increased as a result. That being said, the most likely "cause" of the child obesity epidemic is as you said: increased sedentary behavior due to lack of PE, TV, video games, etc. This behavioral trend needs to be reversed. Baning sodas in school is not affective. Theses students obtain them wether at school or not. Diet soda are use because of the tougher acids. Even though sugary drinks are bad for you, I think that they should allow them in schools. Kids need to learn how to be responsible for themselves, and if they are held away from sugary drinks, they will want them more when they get ahold of them. For example I have a friend who is not allowed to have soda and when he comes to my house, where I'm allowed to have soda, he drinks like three cans. If he was allowed to have it, he could handle it because if you are held from something you want it more. Therefore,I think they should allow them in schools. I don't get it. When I went to high school in the late seventies, we didn't have access to any soda machines. The school offered milk in the cafeteria and that was it. There was one soda machine and that was in the teachers lounge. Kids were alot smaller too! Yes, funny how that happens. Sadly, some kids will get their only lessons in healthy eating at school. So, if banning soft drinks helps them in any way, then ...why not? And when I went to high school, we had vending machines with soda and other junk foods, yet we did not have an obesity problem in my school. We also had mandatory physical education and health classes. You can't blame poor overall health habits on a single food or drink; it's a mindset that needs to be changed. I think sodas, sugary, artificial crap drinks should be provided in schools, markets, everywhere. Otherwise, we may risk to start being healthier and the drug companies and big corporations that provide all this junk food for us will be out of business, many people will be unemployed, people will be living longer, no money for paying them social security, etc. As you can see, things are not as bad as they look. What is wrong with obese children? Could it possibly be that the soda had NOTHING to do with obesity in the first place? Soda at school isn't new, however the obesity problem is growing. Until prices of healthy food go down and kids aren't always in front of the TV/Computer/Video game, just maybe the problem will go away. I think it is ok to have sugary drinks. The people who are trying to stop it are doing the wrong thing. I think having enegy in school is right. Banning soda and other sugary drinks in school has both positive and negative effects. The positives are that students will stay awake easily and be able to pay attention. They will also learn to be responsible with their money by knowing how much they spend on sodas each week. The bad side is that students who are more affected by sugar than others are more likely to crash in the middle of the day. Furthermore, sugary drinks cause tooth decay, and although that may not have an effect on school, it will not look very good. So, as long as students can limit how much soda they have, sugary drinks should be OK. But as soon as sugar crashes start affecting grades, it is time to get rid of the sugery drinks. If the schools keep the ban, it's their choice. The students just need to make the choice if they take the sugary drinks into thier body. It's the students decision to ruin their health with sugary drinks or not. Drinks are sugary and it will hurt their health you are right. But kids will not make the right choices because they are used to their parent making desitions for them. So that leads to them thinking it is ok.
it think its okay to have a sugary dirink once in a while but not during school. only because students will be over energized and to hiper during class! I think that soda drinks should NOT be band! Bacause if people want to have a soda during school now and then, that's fine! Just don't take soda drinks! i think schools should have the soda avaliable, but students should have to make the choice on wether or not to make the choice of eating healthy, which is a decision they will have to make in the future. I love how they say "sugar sweetened". The truth is, these drinks are all sweetened with a laboratory created chemical known as "high fructose corn syrup". It is worse than sugar because it destroys the liver over time and gets converted into fat. Actually, it is chemically about the same thing as regular sugar. The "high" part is a misnomer. It has no more fructose than regular sugar. The FDA makes them use that label because it contains more fructose than traditional corn extract has. It is not a lab-made. Instead, it was created by selective breeding of corn plants. Nature could have made it that way given enough time. Plants mutate in nature all the time and even create hybrids with weeds. Rye was created by "accident," for instance. It started out as an inedible weed that seemed to prefer wheat fields. As winnowing was used to sift out the rye grain, it gradually mutated to become more like wheat, and it even started to cross-breed. Gluten and aspartame are a worse concern, and both poisons, which have no known biological role, are in high amounts in products marketed to children. Yes. Please more stuff like this. I don't want any more responsibility in raising my child because its turned to be really, really hard. Or get rid of diet fanatics, anti-fat fascists, and anorexic lovers. Nothing the school bans is gonna be effective. All its gonna stop is around half of the stuff theyre trying to ban. Our school banned pop machines so people bring pop to school. Some girls have like 50 dollars worth of mtn dew in their lockers. Our school is putting so many restrictions on the dance coming up (cameras, brethalyzers, strict rules, etc.) that people are trying to get everyone to pitch in money to rent out an arena and just have a dance there thats bs free. u can ban all the sugary drinks in the world at school but if these kids parents continue to but them sugary drinks at home ( energy drinks, sports drinks, sodas, etc. they will continue to drink them just not at school so the problem still exists it just not taking place at school. What kids eat is ONLY the family's business. A boy can give another boy a BJ, and that is supposed to be his right, he "cannot help it," it is his body, and he gets protection to make sure he doesn't get bullied or beat to death for his choice. Likewise, a girl can be the school ho and get abortions every other month without her parents knowing, and it is her right. But let a student have a softdrink, and it is a high felony. Why doesn't their right to privacy apply here? Why the bigotry against this choice, but not the sexual ones? My health is MY responsibility and business alone. And I think healthcare should be each person's responsibility, not the government's. If I trash my own health, I should be forced to pay for fixing it out of pocket, and if I am too poor to do that or too stupid to avoid bad choices, then I should die. It should be my right to live or die as I see fit. I wish this blog had properly cited the study to which it refers. I can't find it, and I would like to read it for myself.